Binh Dinh (VNA) – Binh Dinh province in the south central coastal region will achieve an urbanization rate of 48.6 percent by 2035 as projected by the province’s construction master plan to 2035, which was made public on April 8 following the Prime Minister’s approval. 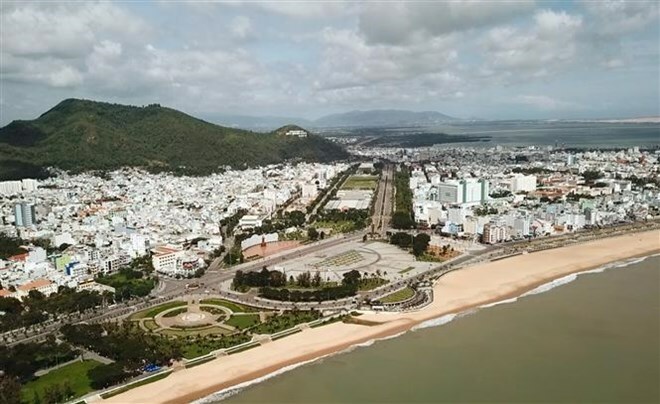 Accordingly, the province will have 22 cities by 2035, with Quy Nhon envisioned to become a first-class city and a national marine economic hub. Chairman of the provincial People’s Committee Ho Quoc Dung said the master plan will create conditions for Binh Dinh to develop its urban areas, marine economy and services-tourism towards sustainable development. Deputy Minister of Construction Phan Thi My Linh said the master plan defines a new vision and development strategies for the region, towards establishing Binh Dinh’s position as an important transport hub of the south central region and a gateway to the East Sea of the Tay Nguyen Central Highlands, the southern region of Laos and the northeastern region of Cambodia. Under the master plan, eight urban areas will be formed from now to 2035, bringing the urban population in the city to 930,000 out of the province’s total population of 1.91 million. The master plan divide Binh Dinh into two economic sub-regions, one of which is dedicated to industry, sea ports, logistics and cultural tourism, covering Quy Nhon city, An Nhon town, and the districts Tuy Phuoc, Van Canh, Phu Cat, Tay Son and Vinh Thanh.